Edward J. Fraughton is a sculptor and inventor native to Park City, Utah. 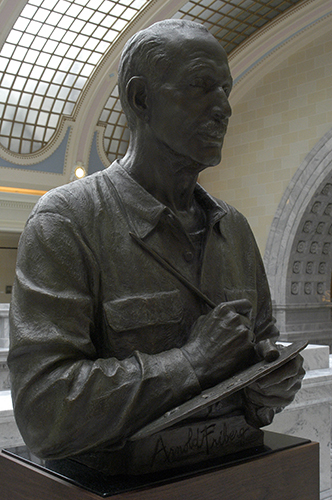 He attended the University of Utah and is a member of the National Sculpture Society and Utah Westerners. His sculptures exude strength and dignity, honoring each of his subjects in thoughtful, powerful ways. Fraughton’s public monuments can be seen locally and nationally, including the Mormon pioneer memorial monument All is Well in Salt Lake City, Utah; the Mormon Battalion Monument in San Diego, California; and the Spirit of Wyoming on the grounds of the Wyoming state capitol in Cheyenne. Fraughton’s work is represented in numerous public and museum collections, including those of the Springville Museum of Art in Utah, the Buffalo Bill Historical Center in Wyoming, the National Cowboy and Western Heritage Museum in Oklahoma, and the Glenbow Foundation in Canada. 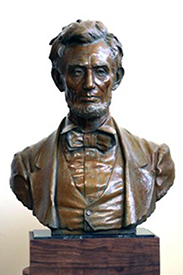 This bronze bust of President Abraham Lincoln temporarily graced the Ceremonial Office of Governor Gary Herbert. A classic portrait of a North American bison, Edward J. Fraughton’s sculpture depicts the majesty of the nation’s most notable range mammal. 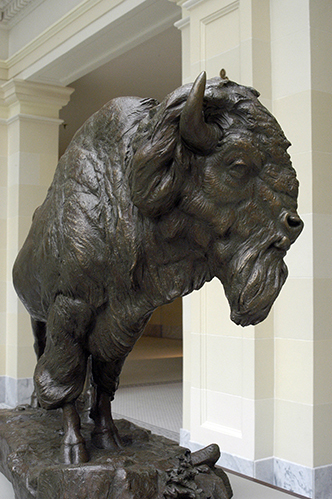 The original motivation for its creation was to propose placing a pair of bison (commonly known as buffalo) on the staircase plinths to guard the West entrance of the Utah State Capitol. A pair of elk, the state animal, was envisioned to face the mountains and guard the East entrance. Through his studies at the Chicago Academy of Fine Arts and Grand Central School of Art, his work with printers and illustrators, and his years of rendering the human spirit, renowned artist Arnold Friberg further developed his innate talents, all contributing to his tremendous artistic accolades. Friberg arrived to Utah in the 1950s. Once here, he painted Pioneer Sunday School, a work that led to the first illustrations of The Book of Mormon. In 1953, he was commissioned by Paramount Pictures and worked as the chief artist, set, and costume designer for the film The Ten Commandments, which earned him an Academy Award nomination for costume design in 1957. He later painted the renowned work of General Washington kneeling next to his horse, The Prayer at Valley Forge, which has been on display throughout the United States, including at the Utah State Capitol, the Pennsylvania Academy of the Fine Arts, and Mount Vernon. Friberg also painted the portraits of His Royal Highness The Prince of Wales and Her Majesty Queen Elizabeth II of the United Kingdom.